A Bunkie board is simply the foundation for a bunk bed, much like a box spring is to a traditional bed, though the Bunkie is considerably thinner. Both serve the function of providing support. The thickness is 2 In. Covered with fabric. 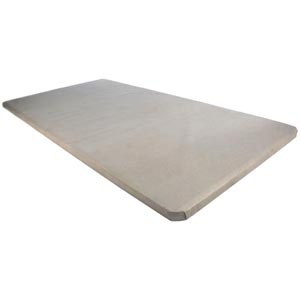 A Bunkie board is a thin platform that fits inside the bed frame to support the mattress. Otherwise, the mattress can sink in the middle and lose shape and integrity. Our Bunkie Boards are made of Solid Pine Wood with a Fabric Cover. Available in Twin, Full, Queen and King Size. Twin: 39 x 75 inches. Full/Double: 53 x 75 inches . Queen: 60 x 80 inches. King: 78 x 80 inches. California King: 72 x 84 inches. For More Helpful Information About Bunkie Boards Please Click Here.